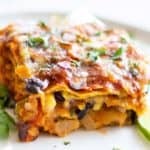 This Vegetarian Enchilada Casserole is so easy to put together, and freezes well for healthy, quick dinners. This is stuffed with black beans, corn, peppers and onions, and is a meal that the whole family will enjoy. After you’ve had dinner, you’ll be so glad you have a 2nd of these in the freezer for another night! This post is sponsored by Sharp Home USA — a brand that brings high quality appliances to our kitchens to make life a little bit easier! I only work with brands whose products I genuinely love. Thank you for supporting the brands that help keep Sunkissed Kitchen running at full speed. I adore South of the border flavors, and combine with that the ease of putting together this casserole, and you’ve hit dinner gold. 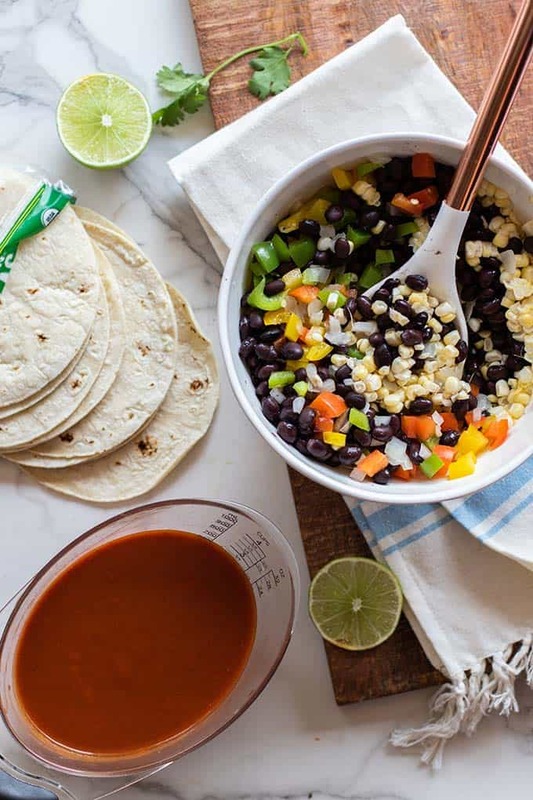 This recipe is one that I make often, with variations, but this classic mix of peppers, onions, black beans and corn is my favorite combination. So much wonderful veggie goodness, but they are also all things that freeze so well. You could go super simple with this, and just use the beans and throw in some frozen corn. With that option, you could have this ready to go in no time. Another option is to totally do it up with extra veggies — broccoli, cauliflower, spinach or chunks of butternut squash are all wonderful in enchiladas. I use my homemade enchilada sauce in this recipe. It makes a large batch (more than you’ll need for this recipe! ), so you can also freeze the extra and use it later on down the road. You have several options when preparing this meal. One, as I’ve done in these photos, use a really large pan, and make a giant casserole. This is enough for several meals. I like to take slices of it and freeze them individually, and when I am ready to enjoy one, I just have to pop it in my Sharp Superheated Steam Countertop Oven, set it on the Reheat function, and it goes from frozen to tasting fresh as fast as I can prepare a side salad. The second option is to make 2 small casseroles that will easily feed a family of 4. Dinner is ready for the night, and you have a second to freeze. My family asks for this casserole often, so believe me, you’ll be so happy on a busy weeknight to be able to pull the 2nd out of the freezer and have a dinner that just needs a little time to reheat! I use 2 8×8 pans when I do it this way, and one goes into my Sharp Superheated Steam Countertop Oven to bake, and the second gets wrapped in foil and then put in a freezer bag to stay fresh in the freezer for up to 3 months (however, it’s typically only a couple of days before we pull it out! Maybe I should make 4 at a time.). Besides cooking 1/3 faster in my Sharp Superheated Steam Countertop Oven, it also makes reheating things a dream! The steam keeps everything moist, all while browning and crisping (do you see the gorgeous crunchy bits on this casserole?). There’s no need to defrost or plan ahead to prepare the 2nd casserole — it will take 7-10 minutes longer to bake if you’re starting from frozen, but that’s no big deal at all! If you’ll be baking in a standard oven, I recommend pulling your casserole out to defrost 1-2 hours prior to baking. Then, bake as usual. Switch it Up: I use corn tortillas in this recipe, but flour would work as a substitute. Also, customize the veggies to suit your taste or to use up what you have in the refrigerator. Spinach works well, and broccoli chopped fine would also be great. If your kids are finicky about vegetables, chopped zucchini or cauliflower also blend into the sauce and cheese and could be a great way to sneak in a few more. Make it Gluten Free: Corn tortillas are gluten free, unless you buy the “soft” corn tortillas, which have wheat flour. Save time: Buy frozen corn, and use veggies that don’t need to be sautéed first. Really finely chopped broccoli or cauliflower, or spinach, mixed with frozen corn would be fine without pre cooking. Make it Ahead: See instructions above for freezing this casserole. It is also fine to keep it in the refrigerator for 2-3 days before baking, if preferred. Increase the Protein: Using leftover or rotisserie chicken is a great way to add protein to this meal if you don’t want to keep it vegetarian. These healthy, vegetarian enchiladas are a delicious meal the whole family will enjoy. The recipe is big, and will make enough for 2-3 meals for a family of 4. Either make a really large casserole (enough for 8! ), or assemble 2 in 8x8 pans and freeze one for later. 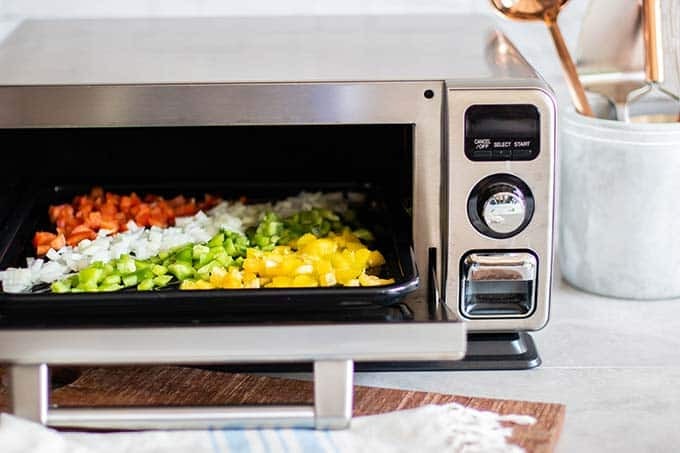 Using the Sharp Superheated Steam Countertop Oven, add peppers and onions to the broiling tray, and bake at 425 degrees F for 15 minutes. If not using a steam oven, the onions and veggies can be sauteed in a frying pan for 5-7 minutes. In an 11x11 pan, add 1/4 cup enchilada sauce to the bottom, and then add the first layer of tortillas. If you do not have a pan this size, you can split this recipe into 2 8x8 pans. If splitting into 2 pans, you'll need to cut some of the tortillas, and possibly use a few extra to make the layers. On top of the tortillas, add a layer of the black bean and veggie mixture. Top with cheese, and then add about 1/2 cup more enchilada sauce (or more if you'd like!). Bake uncovered at 425 for 25 minutes in the Sharp Superheated Steam Countertop Oven. If using a conventional oven, preheat oven to 425, and wrap the casserole in foil. Bake for 30 minutes, uncover, and bake for an additional 5-10 minutes to brown the cheese. There should be a little leftover enchilada sauce. Drizzle on top, or serve on the side if you like. You can also be more generous with the sauce while making your casserole and use the whole amount. *If preparing 2 casseroles, freeze the 2nd unbaked. When ready to bake it, you can put it directly into the Sharp Superheated Steam Countertop Oven, and add 10 minutes to the total baking time. If baking in a regular oven, defrost for 1-2 hours prior to baking. 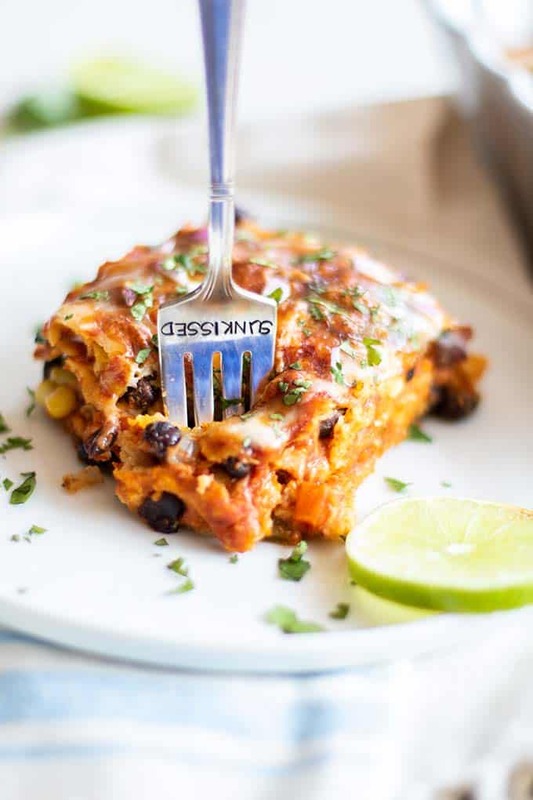 If you make this Vegetarian Enchilada Casserole, snap a photo and share it with me by using the hashtag #SunkissedKitch. Love your recipe. As a busy mom of two, I'm also for quick, easy to make and easier to freeze recipes. Keep up the good work. Thanks Marija! I never used to care about freezer meals-- but having a child really changes things, doesn't it? OMGoodness this looks so good! Definitely saving for later. Thanks Veronica! It is really good-- and I'm just blown away by how easy it is to prepare for multiple meals. We've been eating them out of the freezer and there really is no difference in taste after its been frozen. Totally trying this one since I'm always in search of something organic for my food! Lovely! I'm eating meat free more often these days and I love enchiladas. This is a great twist on a traditional recipe. I love the variation options also! Beautiful post! Yes, please! 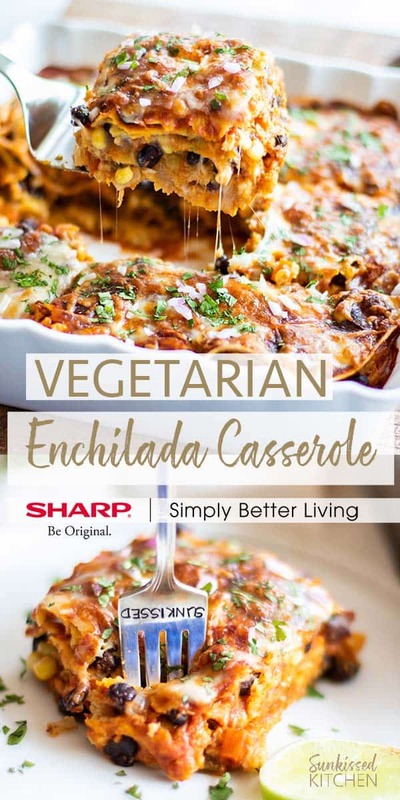 I have been looking for a good veggie enchilada recipe. Thank you!! I think you'll love this one Kyla! This looks so scrumptious. Definitely trying this one out this weekend! This looks heavenly and the perfect recipe for me since I'm going meatless for 2017. Bookmarking! Great Jenn! For a whole year, that's a great goal. I prefer eating vegetarian, but my family doesn't always agree. I am coming up with more meals like this one because no one complains when this casserole comes out! This looks delicious! I love meals you can freeze and reheat later. It looks absolutely delicious! I'm always looking for a freeze-friendly recipe so I am saving this one! Thank you! 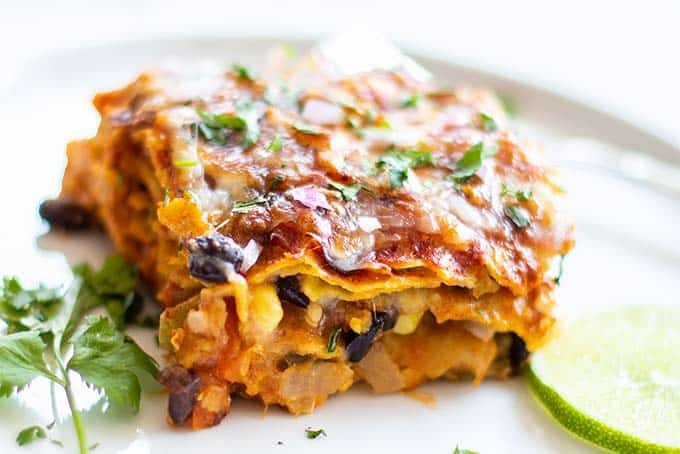 This looks so much faster than the traditional enchiladas I always do for dinner, and it looks like its easier to toss even more veggies in this way- always a win! Going to try it this weekend. I hope you enjoy it Sophie! 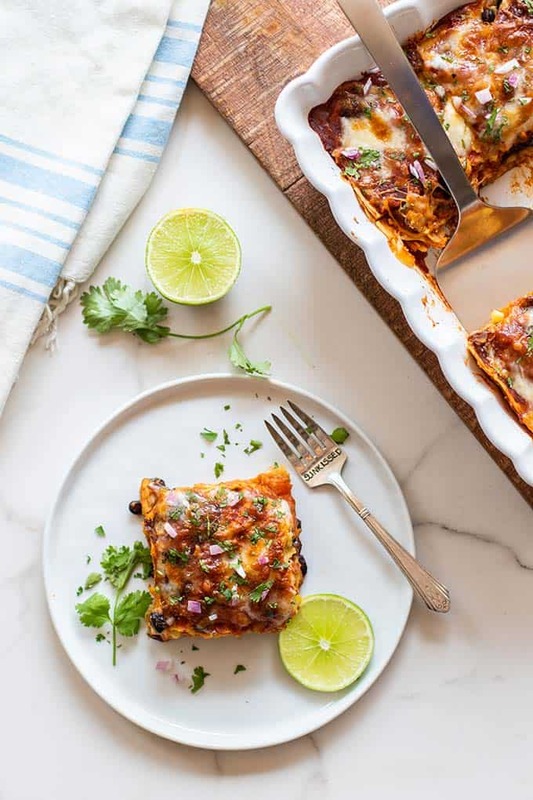 I love making traditional enchiladas, but because I wanted to make enough to freeze some, and this series is designed for people who are limited with time but want to eat healthier, a casserole it was! And it's just as delicious for sure! This looks very interesting. Would love to try this as it seems to be super easy. I've tried beef and chicken enchiladas, but I haven't tried a vegetarian version of the dish. It looks delicious. I think my teen daughter would enjoy your vegetarian enchilada casserole because she doesn't like chicken in hers. Great recipe! We love the veggie version, and no one misses the meat! What a delicious recipe. I do love Mexican food and love the idea of something different than my typical tacos and fajitas. Will certainly make this soon!! I've never even though about making enchiladas vegetarian friendly! 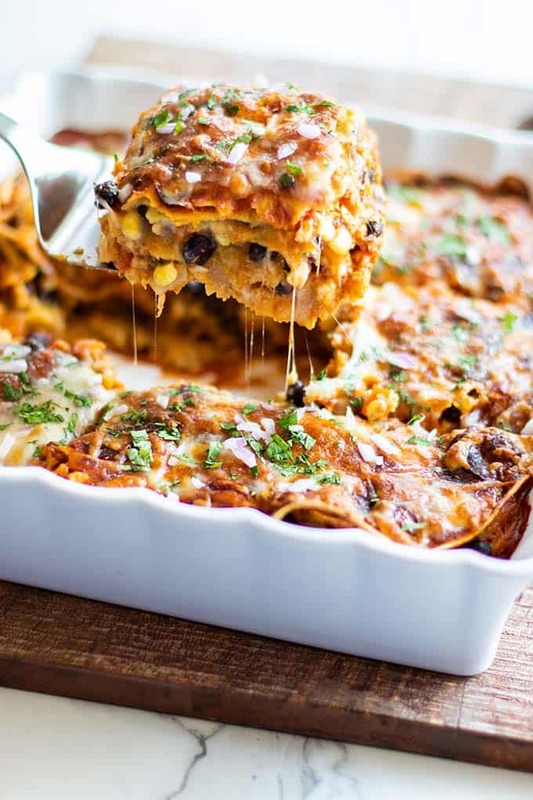 Of course vegetarians would still like to eat the goodness of enchiladas. I bet these taste incredible. now i know what to make this mother's day! Thank you for sharing your recipe! Yay, another great recipe that I've tried from your website! I'm really getting more and more into vegetarian food. Well it's mostly because of my wife but also thanks to your blog. Wow, thanks Brian! I love eating vegetarian, but I do still eat chicken, turkey and seafood. I have been adding more and more vegetarian recipes to my blog lately because that is how I prefer to eat, and getting a little creative with it helps my family enjoy it too! Hi, I see to add black beans in the instructions but don't see amounts in ingredient list. How much do you add? Is canned ok? Hoping to bring this to a new mom who prefers vegetarian meals! Thanks! I'm going to have to review that recipe! I used 1 can of black beans. Thanks for letting me know about that :) This is a delicious and easy recipe-- perfect for a new mom. Especially if you can make a 2nd for her freezer! Hi, This is probably a silly question, but I'm new to freezer meals. Do you freeze a pan of this before baking or after? Not a silly question at all, Erin! I freeze this casserole prior to baking, and then thaw and bake when we are ready. However, I have also frozen half that was already baked and it was fine. It will be best if you freeze it uncooked though - which makes it super easy to stock up your freezer! I'm excited to try this recipe, although I'm questioning the amount of sauce to use. In the step-by-step instructions I see only 1/4 cup x 2 listed (1/4 on the bottom and 1/4 on top). Do I need to add sauce on each of the layers between the top and bottom? Carol, thanks so much for pointing that out! I will go in an edit the recipe to better explain the process! You do need to add sauce between each layer. I love it saucy, so I add probably more than I need on each layer!